Oxidative stress dependent calcium ion (Ca2+) entry is an important second messenger that has been shown to be responsible for a number of signal transduction pathways including neuronal excitability, metabolism, cell proliferation, and cell death. Different types of Ca2+ channels, such as voltage gated calcium channels (VGCC) and chemically gated calcium channels, likely play an important role in the diseases such as cardiovascular, diabetes, cancer and pain. Apart from the VGCC and chemically gated channels, one family of Ca2+ channels comprises transient receptor potential (TRP) cation channels and they were first described in photoreceptors of Drosophila flyers. As potential target on treatment of many diseases, activation and inhibition mechanisms of most TRP channels haven’t clarified yet. Since 2006, a biennial oxidative stress, calcium signaling and TRP channels congress has been organizing by Society of Cellular Neuroscience and Oxidative Stress (HSOD) (http://www.hsord.org.tr/en/). The congress is regularly organized unique TRP channel congress on the world. The abstracts of the oral presentation were published in Journal of Cellular Neuroscience and Oxidative Stress. We have since received a considerable amount of positive feedback encouraging us to organize a seventh congress, with even greater international participation. With the support of the vice chairs, Dr. James Putney and Dr. Mohamed Trebak, we have therefore decided to proceed with the organization of the ”7th World Congress of Oxidative Stress, Calcium Signaling and TRP Channels”. 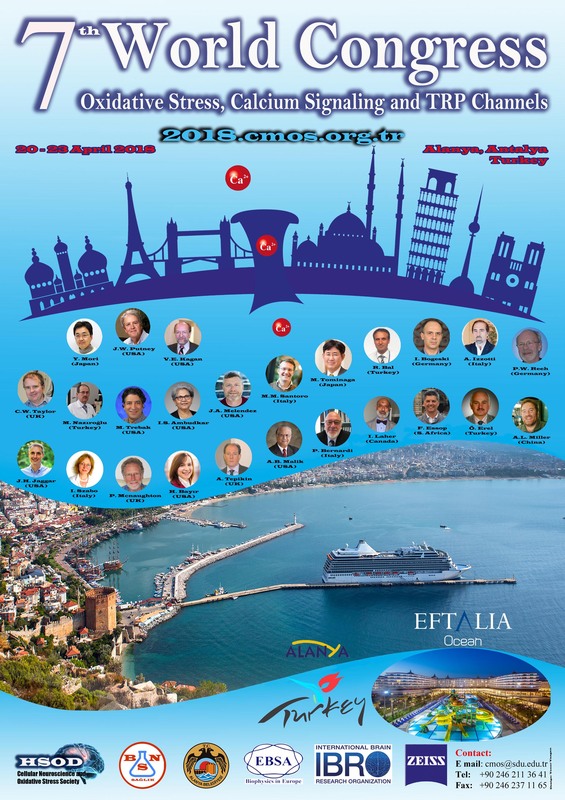 It will be held between 20 and 23 April 2018 in a hotel (with 5 stars) of Alanya, Turkey. The congress will be supported by HSOD and Alanya Alaaddin Keykubat University. Alanya has at least 600 5 star touristic hotels and it is also ancient town with Alanya castle and cave. Apart from the scientific programs of participants, we have specific programs for social activities such as city tour and visit traditional restaurants (please see web page of the congress for the details). Please know Alanya has Gazipasa airport and it is 44 km far from Alanya and Antalya airport is 127 km from Alanya and we will pick up international participants from one of the airports. We look forward to seeing you in Alanya in April 2018.